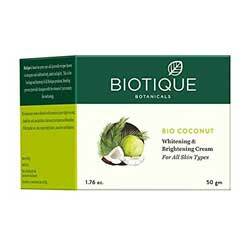 Biotique Bio Coconut Whitening & Brightening Cream Fairness treatment fade away dark spots & blemishes. Skin is noticeably fairer, smoother, brighter. Biotique Fairness Treatment - Worldwide Shipping. This luxurious cream is blended with extracts of pure virgin coconut, dandelion and manjishtha to fade away dark spots and blemishes. With regular use, skin is noticeably fairer, smoother and brighter.